Reposting a Purim classic. In 2012, I created a a digital drawing of hamentaschen, a triangular filled cookie eaten on the Jewish holiday of Purim. 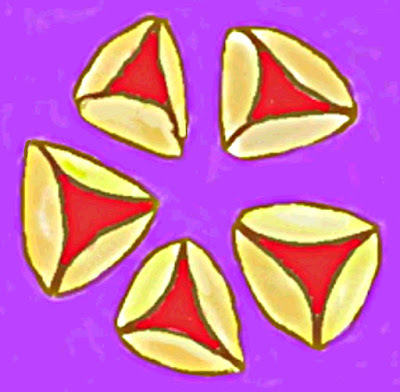 In 2012, I used the drawing as an illustration for a Hamentaschen recipe on our foodblog, seasoningforeverypalate.wordpress.com. In 2016, I updated the image with Painter's posterizing effect. Purim is a holiday that celebrates freedom from oppression based on religion. It's old, but it is a classic, still very relevant today. Here's another photo that I took last week, at the end of my quick trip to New York. I took this picture from the train at the end of my trip, as the train was leaving New York City. This is just about the last point from which you can still see the NYC skyline. It has been a hectic week, but I am making a start at editing some of the photos that I took last week during my quick trip to New York City. 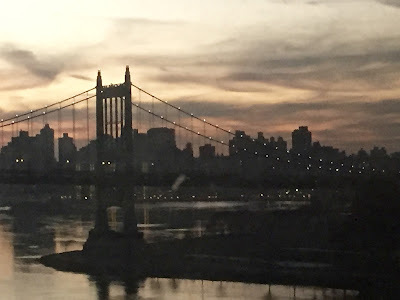 This is one of the last pictures I took, through the train window as we were leaving New York City. Tonight I changed the contrast and sharpened the focus just a bit. This afternoon, I returned to this project for a while. 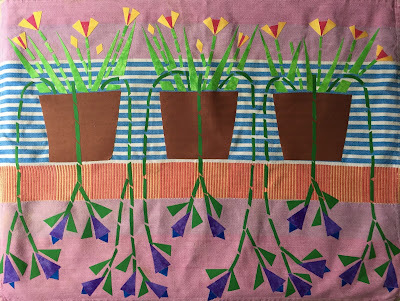 This is an iron-on fabric appliqué inspired by the tea towel that I am using for a background. Today I added another row of blossoms, over the flower pots. I started with a general idea, but not a pre-determined design. I am making this up as I go. 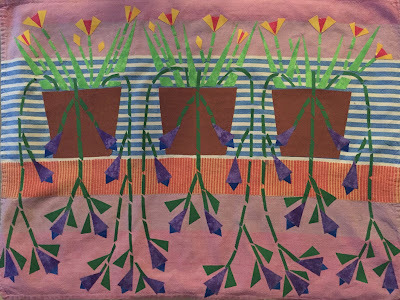 I think I have enough purple flowers now, but want to add more leaves. To be continued. . .
Today I did some more work on this project. 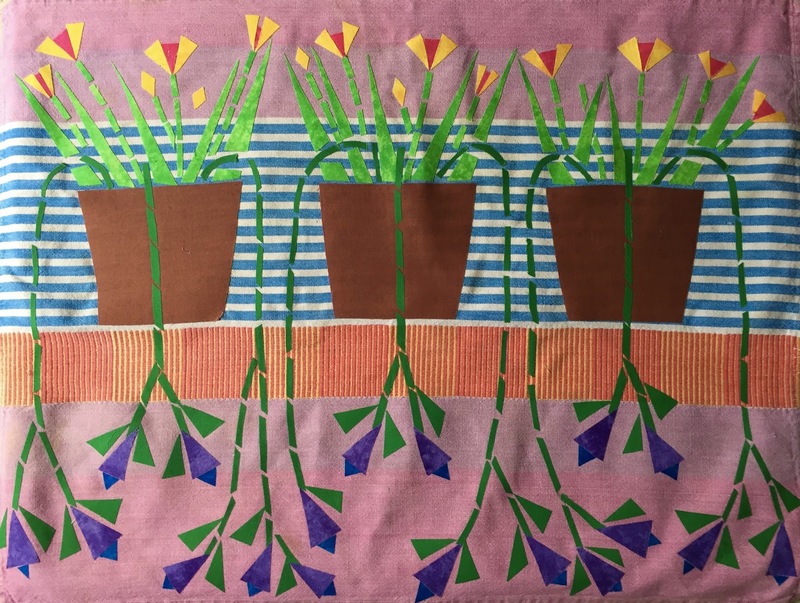 This is an iron-on fabric appliqué, and the background is a tea towel from an old set that I loved. 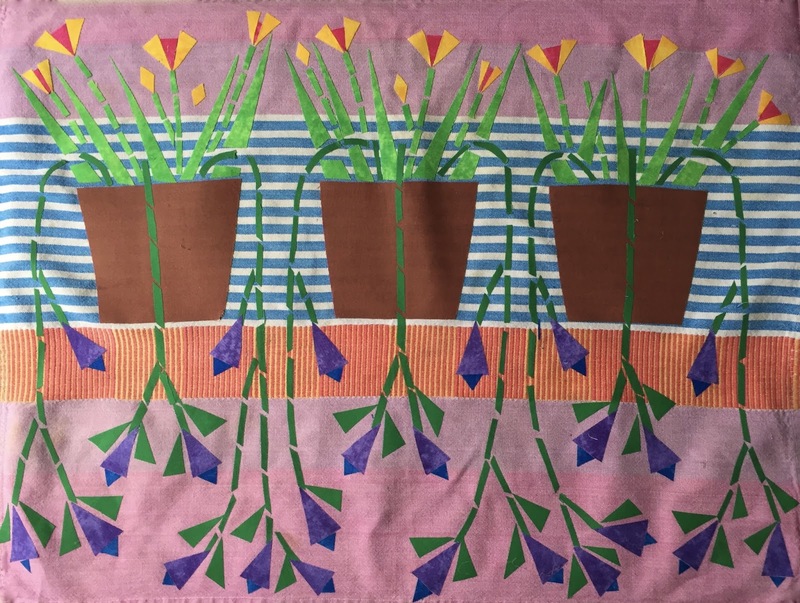 Today I added more stems to the vines and then added purple flowers in the center of the piece. Today I finally had a chance to return to this project. 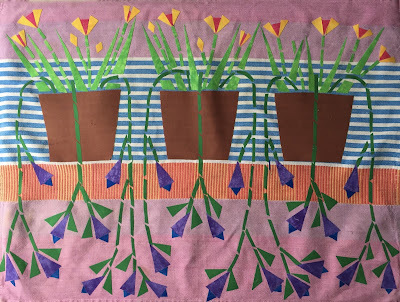 I am making a fabric appliqué of an indoor garden. 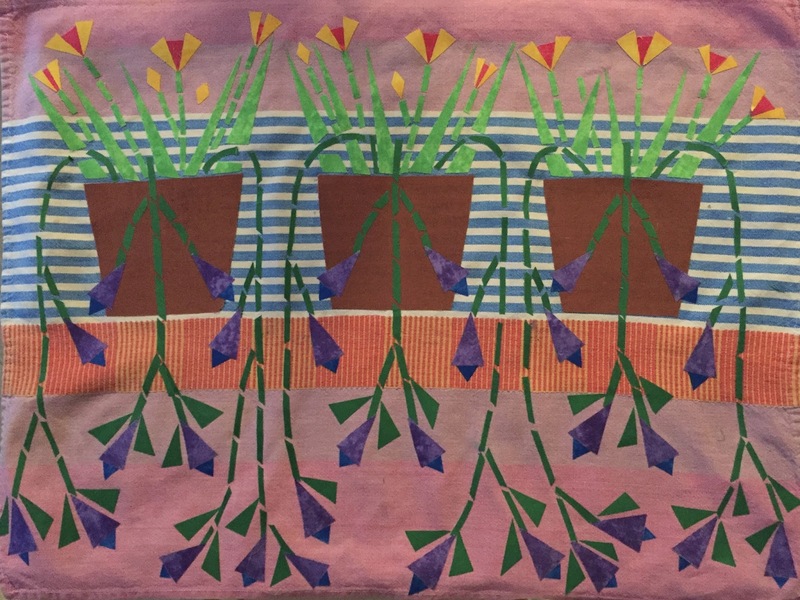 A favorite tea-towel serves as the background and was as the inspiration for this project. Today I began adding green leaves to vines, starting with the blossoms across the lower part of the image. Yesterday I received a beautiful bouquet, completely unexpected. Yesterday's post was a close-up of the bouquet. Today I am posting the same photo but I added a filter with the Prisma app. 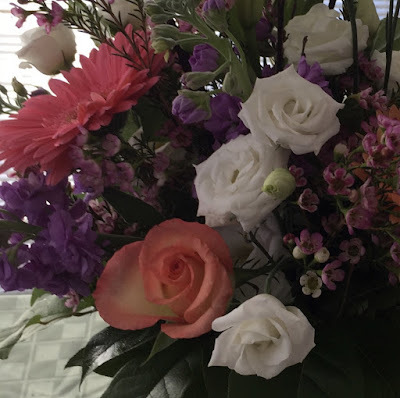 Today I received a big bouquet of flowers and was completely surprised. The arrangement is beautiful, great colors, shapes, and textures, so of course I took pictures. It's hard to get the whole bouquet in a photo, so I try for a closeup. In this case, I think this gives you a sense of the whole bouquet. I also tried putting a Prisma filter on this image, and plan to post that here tomorrow. We had snow overnight, but bright blue skies in the morning. (The combination of snow, sun, and blue skies always makes me think of Colorado.) 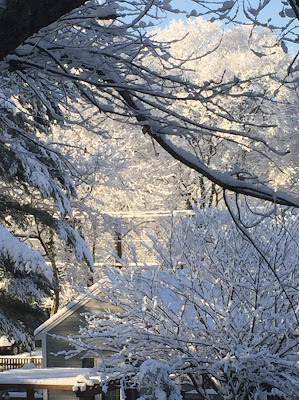 I loved the tracery of the snow on the branches, but I knew it wouldn't last because It was already 32 degrees and soon the snow would be falling off the trees. 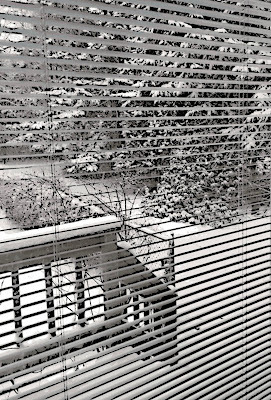 So I took a few pictures through an upstairs window. I have been having trouble with the Prisma app on my iPhone, possibly because I have been having trouble with my iPhone battery. But today everything is working, so I tried a Prisma filter on one of my recent photos of the Zakim Bridge, and here is the result. Here's one more photo that I took last Sunday, during a rainy ride home over the Zakim Bridge. 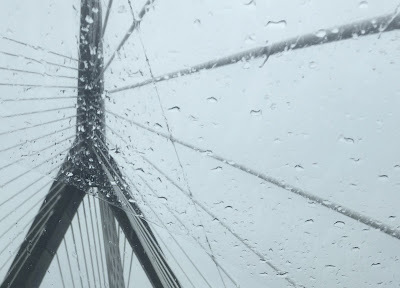 The raindrops and the line made by the windshield wiper made for an interesting contrast. Tonight I edited the original photo to get this composition. Here's another of the photos that I took on Sunday during our trip into Boston. 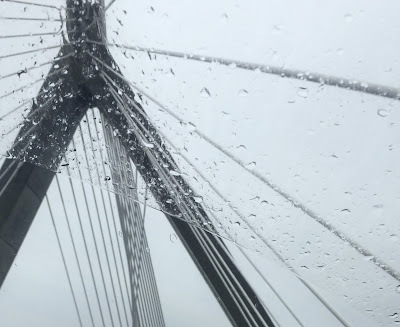 It was raining as we were crossing the Zakim Bridge, heading north for the trip back home to Beverly, MA. 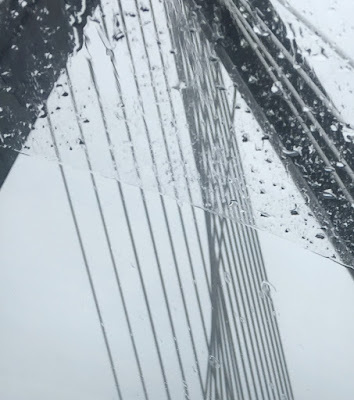 I like the juxtaposition of raindrops and the lines of the bridge, so I took some pictures. Today I edited the original photo to get this composition. 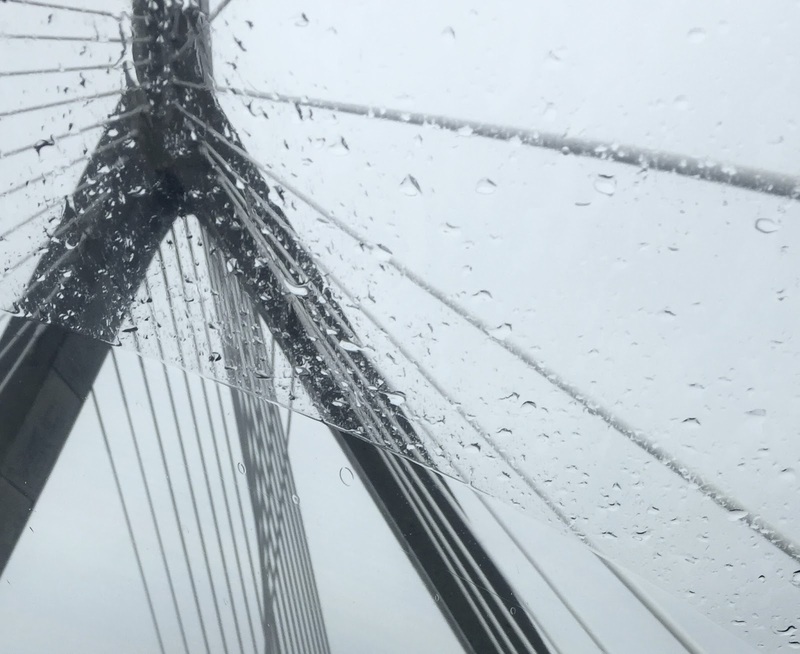 I love the Zakim Bridge and always try to take photos of it whenever possible. This is one of the photos I took on Sunday. We were headed north after a very rainy day in Boston. Tonight I cropped the original photo to get this composition. This is a photo that I took today during an early afternoon walk at Lynch Park here in Beverly, MA. The tide was out, the rocks were visible, and we walked down on the beach. 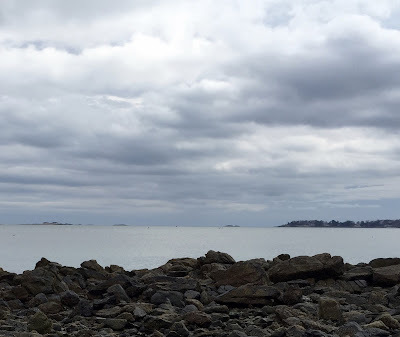 I liked the way the gray sky and the ocean contrasted with the exposed rocks, so I took a picture. Tonight I cropped the original to get this composition. Catching up on posting here. I took this photo on February 11. We drove into Boston with our visitors and stopped off at Galatea. This painting was on display in the Artists' Alcove for January, so I took a picture. 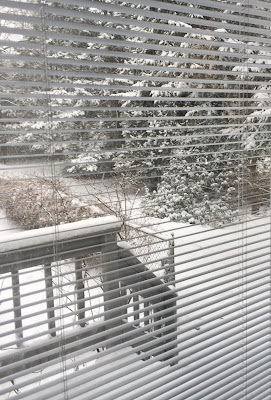 Yesterday's post was a view of the snow through the blinds. Today's post is the same image, but with Painter's woodcut effect added. 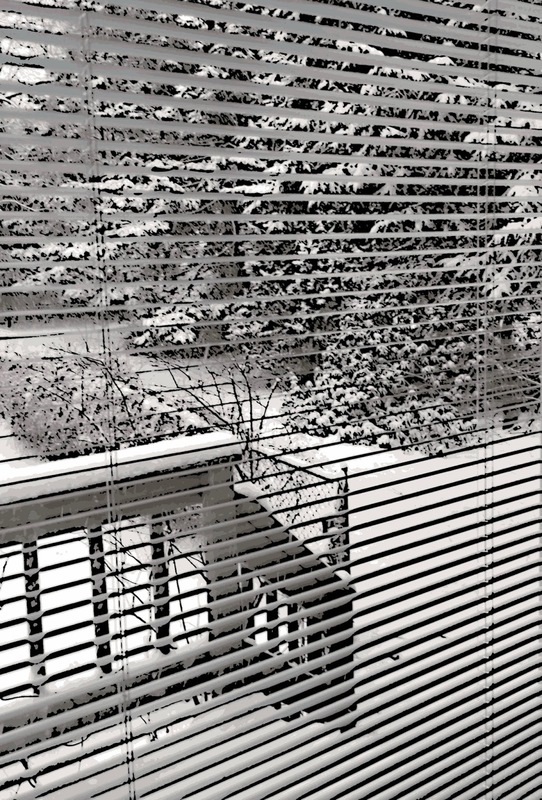 At the end of January, I took this photo that shows winter the way I see it first, through the window blinds. Tonight I cropped the original to get this composition. I also used Painter to add a digital woodcut effect, and I plan to post that version tomorrow. Today I went back to the old iPad to finish up this exercise. Ten years ago, when I turned 60, I did a self-portrait in oil bar on canvas. I turned 70 yesterday and for weeks before I had thought about doing another self-portrait, but found lots of reasons to put it off. 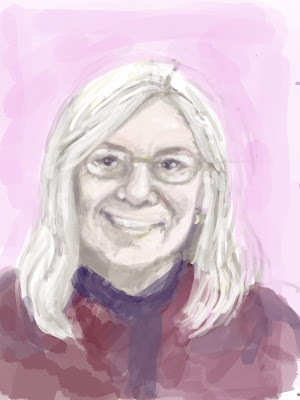 But a few days ago, I decided to try a self-portrait on my iPad, using the Procreate app. This is my first real attempt at a digital portrait. It was quite a struggle. I started from memory, and then switched to some recent photos, and finally found an old photo that had the head position and facial expression I was looking for. Procreate captures a video as you draw, so I have been using that to see how the self-portrait was progressing. It was both horrifying and useful. (If I get brave enough, I may post the video so everyone can see this struggle.) Anyway, this afternoon, I made an adjustment to the shape and width of the face and jaw, and cleaned it up and cropped it. 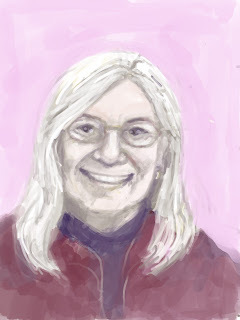 I am happy enough with this self-portrait to call the exercise finished. 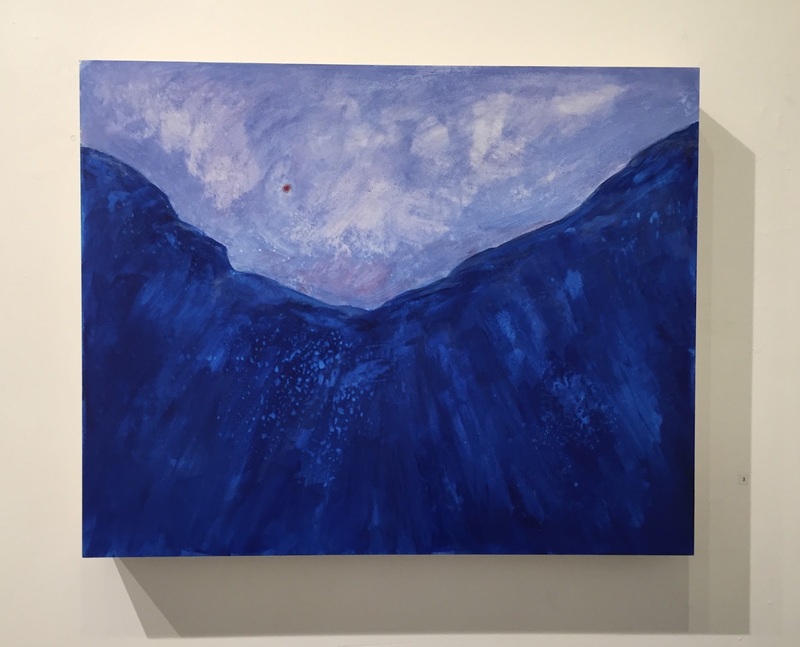 But the title is "Seventy (A Work in Progress)" because that is what I (still) am. 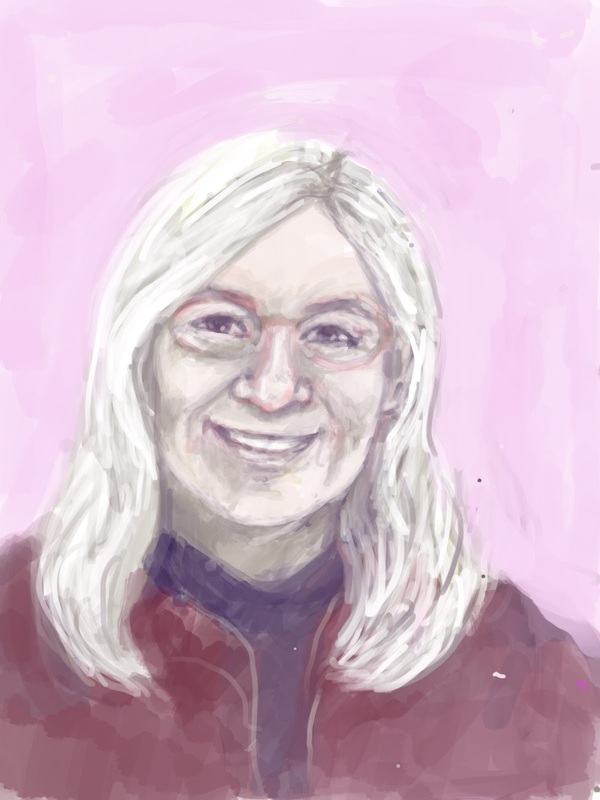 This afternoon I did a little more work on this self-portrait. This is my first real try at portraiture on the iPad, using the Procreate app. After I posted yesterday's version, I realized that the eyes weren't lined up righ, so I concentrated on fixing that today, and I think it helped. But this is still a work in progress, as am I. Today I continued to struggle with this self-portrait. This is my first (somewhat) serious attempt at portraiture on the iPad, using Procreate. I am not staring at myself in a mirror, but am using photo references, some recent photos combined with an old photo taken in the 80's because it shows my head in the right position and the facial expression I want. Yesterday I figured out although the features were pretty accurate, the spacing of the features was wrong. So today I began to bring the eyes closer together, and from there adjusted the nose, mouth, and the shape of the face. I marked up the changes in red so I didn't get lost. Procreate captures a video as you draw, and I watched the video a couple of times and that helped me to see if my changes were improving things. This is better, but still a work in progress. This afternoon, I continued the little crazy-making exercise I started yesterday, a self-portrait. 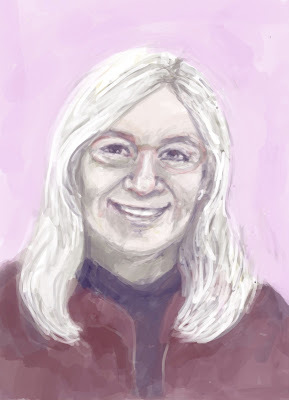 Any self-portrait is quite enough to make me crazy but I am attempting this one on my iPad with the Procreate app. Yesterday I began from memory, then used some recent photos that my son took while we talked on Facetime. But there were several photos (and several variations on my expression) so I was getting a bit confused. Today I came across a picture of myself at 35 and the position of my head and the facial expression were pretty close to what I had in the portrait. So I decided to use that old photo as a guide to feature shape and placement, and then add the changes of age to that. I think that helped in that I am more confident that the features are basically correct. But just as I ran out of time (and battery), I realized that the facial features are set a bit too far apart, which is throwing the proportions off. So I can see a family resemblance to some of my cousins, but it's not quite me yet. I will try to fix that tomorrow. To be continued. . .
Tonight I used Painter to add posterizing effect to the photo that I published here yesterday. 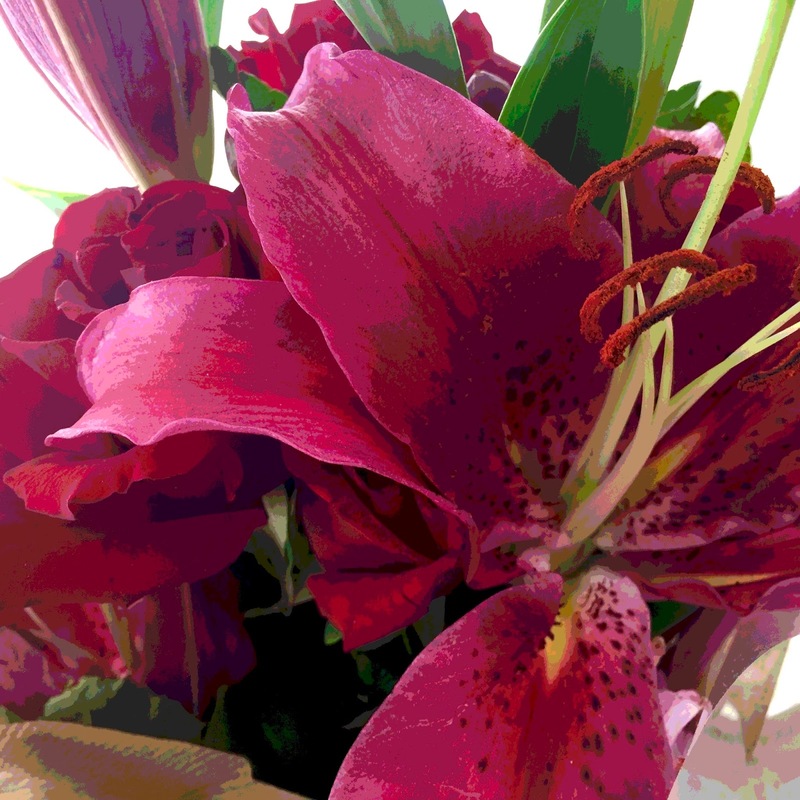 This is a closeup of a bouquet of red roses and pink lilies that I bought for my daughter yesterday. This morning I was out running errands and saw a very striking bouquet, red roses and big pink lilies. It was beautiful and very unusual combination. On the spur of the moment, I decided to buy the flowers for my daughter, who loves flowers even more than I do, always has. This is one of the photos I took of the bouquet before I gave it to her.